Cochrane Taiwan is the culmination of sustained activities over the past 10 years around training in systematic reviews, promotion of evidence-based practice, promotion of the Cochrane Library and translation of Cochrane abstracts. It started in 2003 at National Health Research Institutes (NHRI) as project for EBM promotion. In the beginning of 2005 through the project funding of National Science Council (now Ministry of Science and Technology), NHRI started purchasing Cochrane Library for regional and district hospitals other than medical centers. NHRI continued promotional activities including workshops, also with this funding, we began translating Cochrane abstracts. At the same time, Department of Health (now Ministry of Health and Welfare, MoHW) support the funding for clinical practice guidelines. In 2007, Taiwan Evidence-Based Medicine Association (TEBMA) was formally established; this put the promotion and training in a formatted course. Beside local experts, specialists in systematic reviews from Cochrane networks in the region, particularly Edwin Chan from Singapore, have contributed to the training workshops. 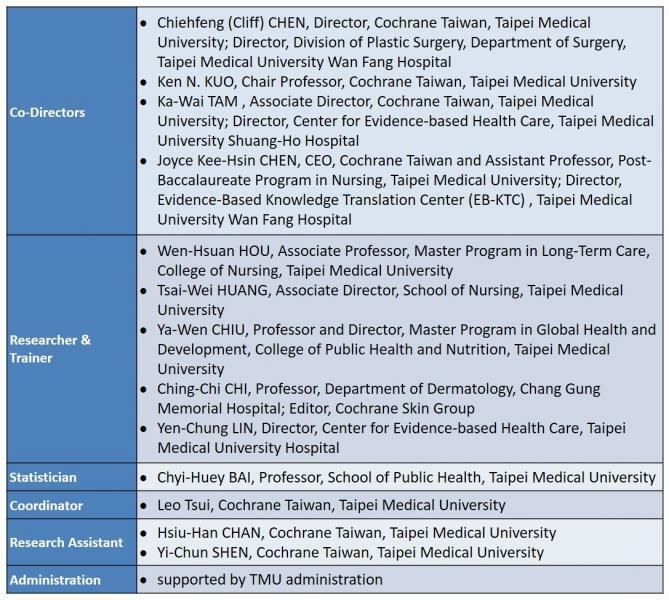 Since 2011, we have established Center for Evidence-Based Medicine at Taipei Medical University (TMU) with support including funding from MoHW and TMU. MoHW continues the subscription of Cochrane Library for all public hospitals. The Center in collaboration with TEBMA enhances the mission of EBM and systemic review in Taiwan. --Taiwan was instrumental in establishing an informal alliance of countries in East Asia in 2007 that meets annually and provides opportunities for training in systematic reviews. --Taiwanese are frequent users of the Library, often in the top ten of countries for full-text downloads, the top one in non-English speaking countries for many years. --Taiwan has around 3800 Cochrane review abstracts translated into Traditional Chinese by a network of 500 clinicians. --There are about 50 authors from Taiwan contributing to 20 published Cochrane reviews and protocols.